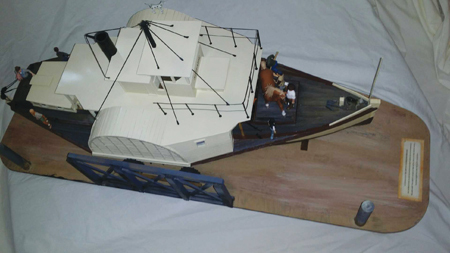 MODEL BOATS & BITS ... $1,500 negotiable, it must go. SS Adelaide, scratch built to measured drawings of the fully restored boat operating out of Echuca; battery powered and radio controlled, operating paddle drive, fitted out with a full crew, passengers and stock, bales of hay, duck family, and including a farrier plying his trade, typical for the type of work she would have carried out during her long working life. The towing mast and braces are all operational and she will tow a small dinghy, slowly as befits the dignified lady of old. 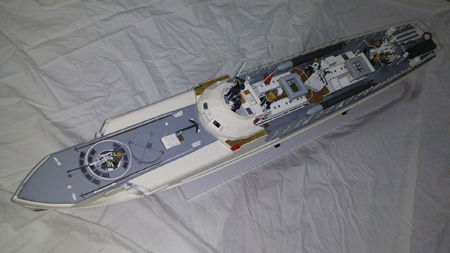 Finely detailed ‘plastic magic’ (motorised and radio controlled plastic model – total of kit prices for boat, crews and accessories in all $450, plus all the motors etc); German WWII patrol torpedo boat Schnellboot triple shaft drive, battery powered, fitted out with professionally engineered brass and stainless scale props and rudders (receipts for $514), and full crew at battle stations immediately before D-day. An extremely efficient war boat, a small flotilla of which struck a blow against the assembled D-Day ships by a daring swift night time raid. Very quick model on full throttle with all shafts turning; an atmospheric and stunning model of a magnificent war machine. (some of the latter still in their unopened wrappers) and lots of modelling ‘stuff’. Philippe loves his Mk2 NIS18 Turbo Ketch Didi so much he’s gone out and bought an NIS NIS29. So now Didi is for sale. Very well built, only only 4 years or so old, good everything. Philippe is a tough guy who feels no need for comfy mattresses in the 1/4 berth or the vee berth. cruise and extend the NIS lore wherever she goes. Change your life. The future you, will thank you, for this! Dusty built this fine ship, inspired by Annie Hill’s famous book on the Benford Badger, in the late 90’s. 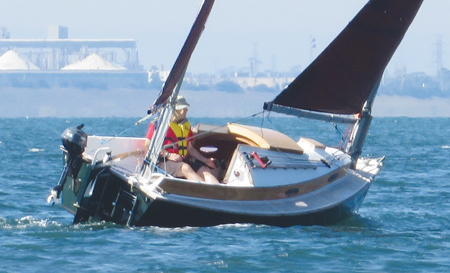 Dusty drove out of Queensland with a broken heart, and I think he built his Jay Benford designed Badger with justifiably romantic visions of sailing over the horizons and finding peace and romantic adventures on distant shores. It worked! But Dusty did not need to travel far beyond the workshop. In the final phase of building Dusty was living aboard, and while living aboard, the vision of Badger was fulfilled, without the boat even being launched. Since then Dusty has swallowed the anchor, and now lives with the love that came to Badger, and into his life in the Adelaide Hills. Still with Badger, not quite finished. Where she still is. Time has passed, and it seems the old love must move on. Looking around Badger with Dusty the other day I was struck by several things. Badger IS a Tardis. This is not a boat that you camp in, inside. Badger is a home. Home on the sea, for 2 plus a couple of kids. Utter luxury for two. The saloon/galley is vast, head room and walk around flat floor everywhere. The portlights are large, and the classic 2 leaf skylight above floods the attractive off white and clear wood detailed space with sunlight, and opens to provide the best ventilation. The forward double cabin seems like a stateroom, and the smaller aft cabin has room for a couple of children, while the saloon seats are big enough to be sea and guest bunks when needed. The galley is house-like, all gimballed 4 burner marine gas stove and oven, good sinks and drainboard with insulated stowage under. Outside the big cockpit area is inviting, and the wide. gently arcing cabin top will be great place to sit about in the sun reading or taking in the world as you, sail on. The second thing is how well, even though unfinished, she has been built. Bote Cote Epoxy Resin lavished over Okoume BS1088 ply inside and out, and set in heavy glass up to the waterline and lighter above. Wonderful detail work inside and the choice everywhere of the best over the most frugal, the cooking arrangements to the fore. The masts are pretty much completed, and the tanbark sails have never felt the elements. The keel timber structure is in shelter, and there is a large quantity of lead ready for casting into the keel. Years ago someone asserted that most boats reach a point in their lives where they need a new owner to fully realise their potential. Go to the Boats For Sale section on our website for more details. 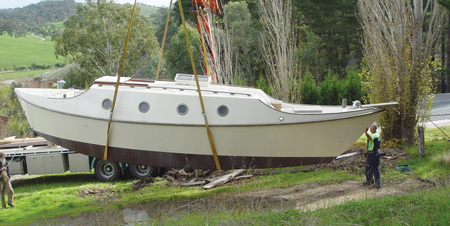 The fabulous 57’ Canoe sterned Bacarli has been owned and lovingly cared for by a prominent Adelaide family since 1986. Built In 1950 at Blunt’s Boat Yard in Williamstown, Victoria, Bacarli has cruised between Queensland, Victoria and South Australia. The spacious comfortable Bacarli is now ready to safely carry another family, to horizons only limited by imagination. She draws a bit over 2m, is capable of being sailed by one fit person, but is best suited to a crew of one or two. 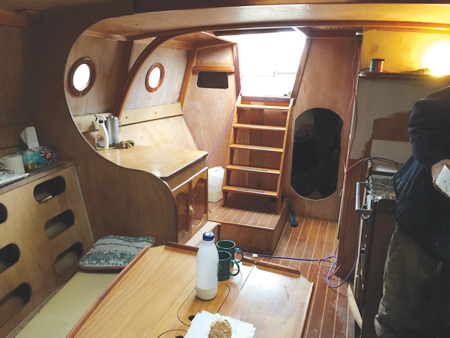 Her space on deck, and her space below is palatial, especially in the saloon/galley area. Now, Bacarli is looking for a new and adventurous owner who is capable of getting the best from her, and in return giving her the ongoing love that such a beautiful mistress of the sea deserves. Moored in Adelaide. Ready to go, now. HOT! NIS23 ROUTE 66 IS FOR SALE! Corio Bay’s Rob Ballard, as then president of the of the Victorian Trailer Sailor Association and wife and sailing partner Annis were always going to be discriminating clients. 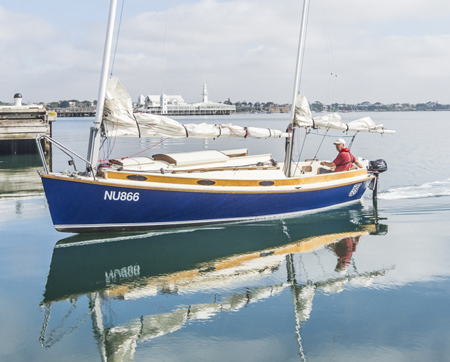 Now, time and tide have caused a rethink, and as a consequence, Route 66, the bright blue race winner from Corio Bay, is now for sale. There are bragging rights with Route 66. She bristles with all the good gear. Super lightweight carbon masts and booms. Rapid low stress rigging and packing up with the patent pending tabernacles system. All sail control within the cockpit. A comfortable interior for two, who like each other, for extended cruising. Self steering just by setting the sheets. A hull shape that eats the square waves of Port Phillip Bay, the Mornington Peninsula and Bass Strait and stays remarkably dry while doing it.